If you find it difficult to grow flowers in your own garden, imagine the work it would take to grow a whole public garden’s worth! Keeping a garden involves planned layouts, hardscaping, maintenance of the grounds and facilities, and the ability to create a haven for people to escape. It sounds exhausting, but luckily there are plenty of hard-working individuals who have already painstakingly created beautiful gardens for all to enjoy. Botanical gardens across South Carolina provide us a quiet place to walk or the perfect backdrop for special events. Take a trip to these 10 beautiful botanical gardens in South Carolina—you’ll be glad you did. Eleven acres of flowers, trees, fountains and other beautiful scenery composes Glencairn Gardens, a hotspot for locals and travelers alike. Guests enjoy free admission as they stroll amongst the greenery, which now includes a veteran’s memorial. While the gardens are open to the public year-round, the best times to go are during peak blooming season (which starts in March) or during one of the garden’s many festivals. The menagerie isn’t the Riverbanks Zoo’s only draw—their onsite botanical garden makes just as strong an impression. Included in zoo admission is a chance to wander the lush gardens and see what’s growing. From the children’s garden to the Asian garden to other sections with various themes, visitors will soon see why this botanical garden was named one of the top 20 Best Public Gardens in America on HGTV. Truth be told, there’s a lot more here than plant life. The non-profit Brookgreen Gardens has maintained its status as a cultural hub since its beginnings in 1931. Along with beautifully crafted gardens, art sculpture, and other scenery, guests can take riverboat tours, visit the butterfly pavilion, see the zoo animals, ride bicycles, and explore all that Mother Nature has to offer. As one of the state’s most culturally rich cities, Greenville always offers a little something for the kiddos. The children’s garden at Linky Stone Park creates a perfect forge of education and excitement as children of all ages can interact with exhibits and feel as though they are living in a fairytale land. 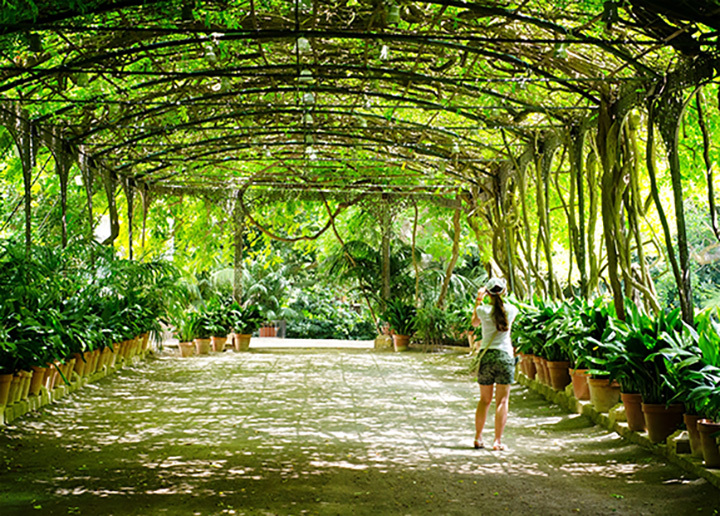 There’s a reason why all the locals use these botanical gardens as a backdrop for weddings, prom pictures and other special occasions—it’s simply breathtaking! Situated near the Clemson University campus, guests can explore nearly 300 acres of nature, including historic buildings, ponds, a children’s garden, a butterfly garden, geology museum, amphitheater, and other specialty features. A hidden gem in the Pee Dee region, Moore Farms is a 50-acre garden highlighting its flora by highlighting everything else around it. The garden serves primarily as an educational and research center, where art and science come together to create a unique experience for everyone who visits. However, it should be noted that Moore Farms does not have regular visiting hours, so you will need to call ahead to plan your visit. There’s always something blooming year-round at Hatcher Garden. Nearly 50 years ago, Josephine and Harold Hatcher saw potential in a poorly maintained plot of land once functioning as a cotton field. With a little love and a passion for nature, the Hatchers transformed the decaying property into the thriving nature epicenter now known as Hatcher Gardens. Visitors can enjoy tours and educational events, as well as exercise programs and special events. Although a part of Coker College, Kalmia Gardens are open to the public. Here you can observe both plant and wildlife in their natural habitat, as well as learn about the flora and fauna surrounding you. Visitors can join in on programs for adults and children, or simply explore the area on their own. If you’re a fan of the Japanese Iris, you won’t have to travel all the way to Japan to see it. Swan Lake Iris Gardens is named so because of its extensive collection of Japanese Irises. In addition, you can also find a number of other flowers, as well as wildlife, a butterfly garden, a chocolate garden (yes, you read that right). Swan Lake Iris Gardens is also the only public park in the nation that plays home to all eight species of swan. You’ll need to do some planning if you want to visit the gardens here, because they are only open during an open house once a month. But if you can manage a visit here, you’ll find plenty of pretty flowers and other nature scenery to fill your Instagram feed. When the arboretum is closed to the public, the site is mainly used for teaching biology. View more South Carolina Botanical Gardens and Nature Centers.